Sunday night, February 9, 1964 on The Ed Sullivan Show, television introduced The Beatles to 73 million Americans, or nearly 40% of the total population of the country at the time (by comparison, this past Sunday’s broadcast of the Super Bowl, the highest rated showing of that annual extravaganza, was viewed by an estimated 111 million Americans, or about 36% of the population). 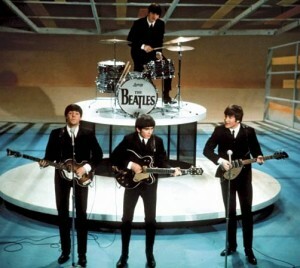 Click here for a 10-minute tape of the Beatles first night on American TV. For my Top 50 Beatles' tracks in two playlists, click here.